Italy is full of commemorative plaques and statues, many of them about the Risorgimento, the unification of Italy, and the independence wars from 1861 on. There are plaques and statutes to commemorate the landing of troops, successful battles, sustained defeats and events of similar magnitude. Every city, every town, every village wants to have a piece of the fame and honour of the Risorgimento and therefore puts up plaques, even if the fighters for Italian unification only changed trains at the local station or stayed at a house for the night. Any bagatelle is being proclaimed by proud plaques. 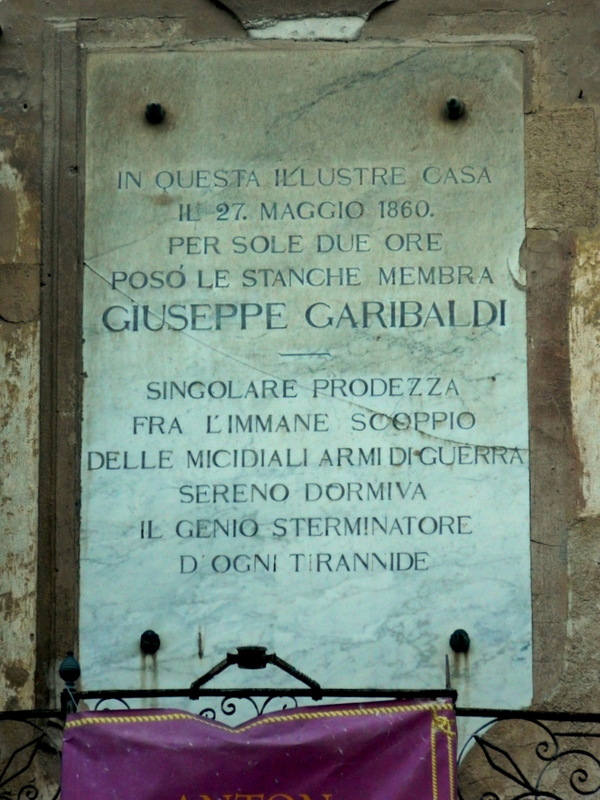 The national hero mentioned most often is Giuseppe Garibaldi. Even the tiniest village has a Garibaldi Street or a Garibaldi Square or a Garibaldi Park, often all three of them. When I was in Palermo, I discovered the tentative culmination of this Garibaldi-worshipping. An admittedly magnificent house on Piazza Bologni is adorned with a commemorative plaque of the size of a window across the archway. What may have happened here? A meeting of freedom fighters? A political congress? Or did the villa serve as a hospital for the wounded? I stepped closer to decipher the writing, my notebook in hand, ready to record the historical event. it took a few seconds for me to be sure that I had understood the Italian writing chiselled in stone correctly. Then I had to laugh. In this elegant house, on 27 May 1860, he rested his weary limbs for only two hours. Such a nap is indeed an achievement worthy of appreciation. I couldn’t fully translate the second part of the inscription, but it mentions something like the “unique bravery of the genius destroyer of all tyranny to calmly sleep between the explosions of deadly weapons of war”. 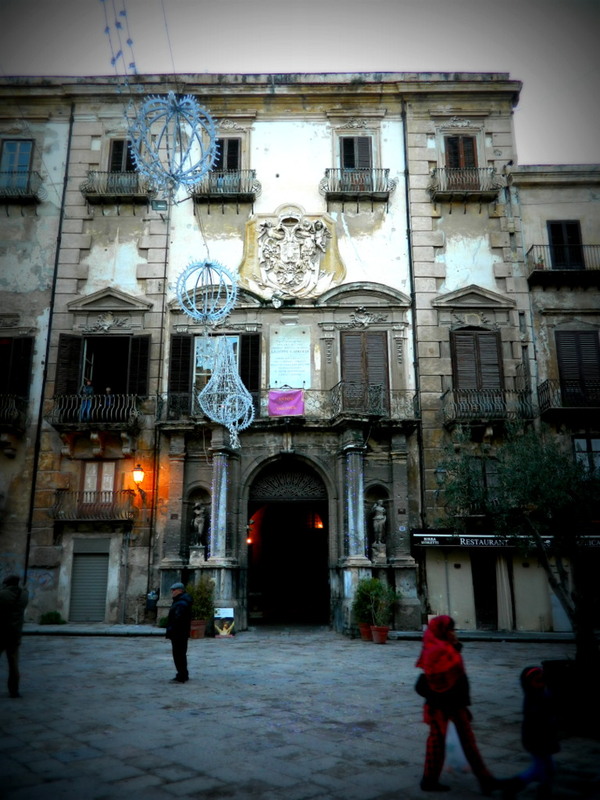 This entry was posted in History, Italy, Photography, Sicily, Travel and tagged Garibaldi, Palermo. Bookmark the permalink. The correct translation is ..HE rested his weary limbs…. Moreover, please do you know who was Garibaldi? He is also called the “hero of the two worlds”. No laughing allowed. Thanks for correcting the pronoun. I am not laughing about Garibaldi, by the way, but about those who put up these plaques all over the country. Ha ha! It mentions that it was a singular feat. Would he never go back… bed bugs perhaps? Did he just take his after lunch riposo there I wonder? Sleeping during a unification can’t be easy… lol! Garibaldi is also a hero in Southern Brazil where he fought in Revolução Farroupilha. 1) “Unique act of bravery during the outbreak of war” – removed some of the literal translation. Well said, perfectly correct. I feel that it that the grammar could also infer that the 2 hour nap was an act of bravery in itself. Hence my reference to bed bugs.